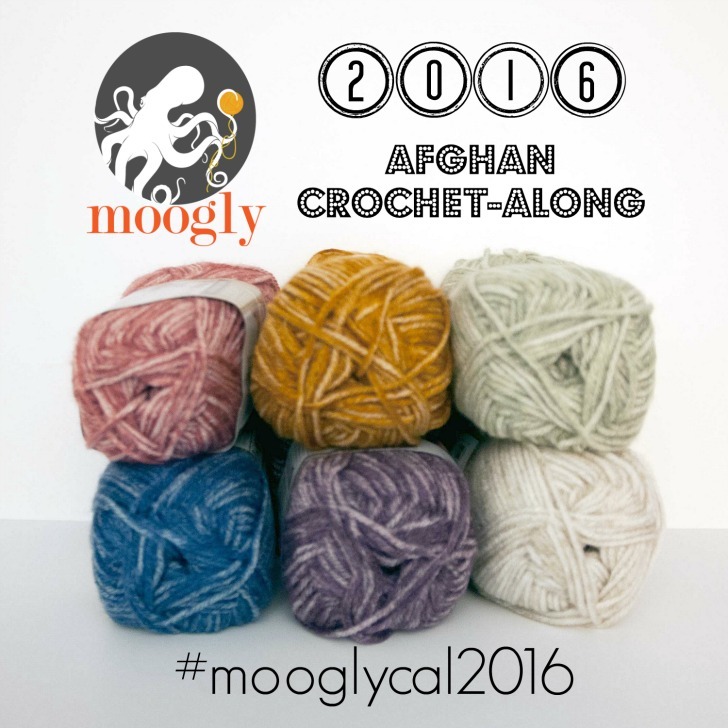 Welcome to block 3 of the 3rd Annual Afghan Crochet-Along here on Moogly! 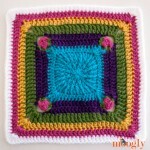 This week’s square is fun, quick, and very easy to follow! 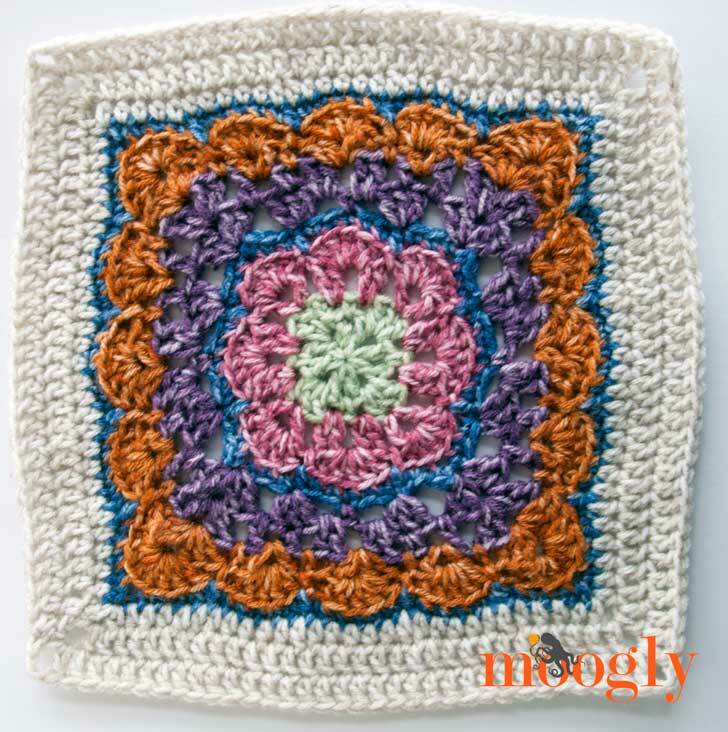 Block #3: Winter Bloom Afghan Square by Danyel Pink, on Danyel Pink Designs: CLICK HERE to go to the pattern page but first, read my notes below! 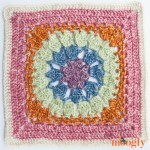 To print this pattern or create a downloadable PDF, enter the pattern page URL into PrintFriendly.com. You can also cut and paste it into a word document. 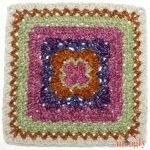 This pattern is pretty easy to follow if you take your time, and if you get stuck, the photo helps! 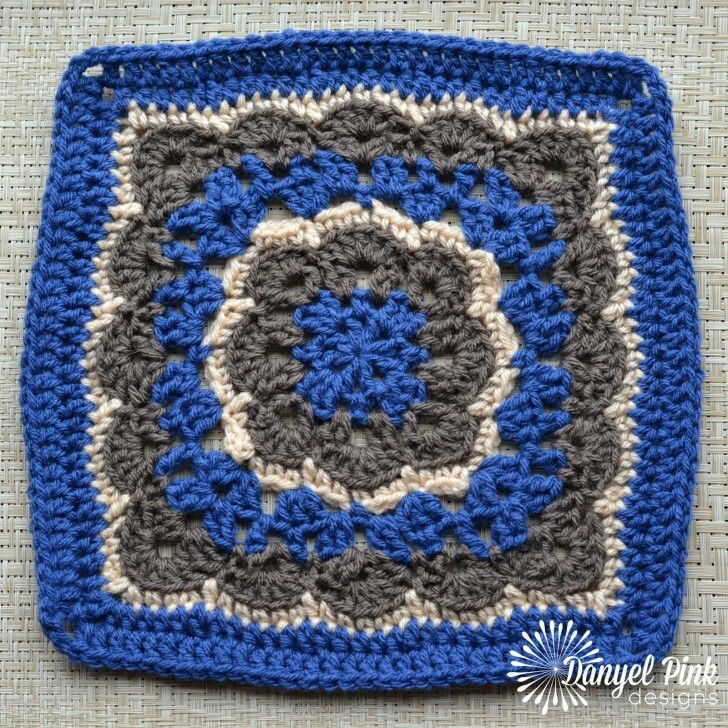 My square was coming out a little bit small (I’ve become a tight crocheter! ), so I added one row of dc, and then it came out at 12″. But everyone is different so be sure to measure as you go! Learn more about adjusting for size HERE. Remember that the 12″ is measured across and up and down – not diagonally corner to corner. I used Lion Brand Vanna’s Choice, and my color order was as follows: Rnd 1-2: Seaspray Mist; Rnd 3-4: Rose Mist; Rnd 5: Denim Mist; Rnd 6-7: Purple Mist; Rnd 8-9: Tangerine Mist; Rnd 10: Denim Mist; Rnd 11 – 12: Pearl Mist; Extra Round: Pearl Mist. 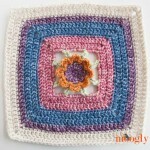 I just noticed that round 5 on the pictured square is denim, but in the written comments, round 5 is purple! Not a big deal. I like this square. Very pretty! I look forward to the next one! For some reason I’m not too clear on round 10, on the first directions. Plz help. Hi Rena! What part of it is giving you trouble? Hola Marga! You would need to ask the designer for the chart, I’m afraid it’s not my pattern to make a chart from!